Landon Mayer has been guiding professionally in Colorado on the South Platte River since 1997. His success in catching trout is fueled by an addiction to pursue large trout with small flies and lightweight fly-fishing equipment. Landon enthusiastically teaches and demonstrates his techniques and on-river knowledge to fellow anglers and has developed innovative strategies for sighting, hooking, and landing selective trout. Landon Mayer has fished Colorado his whole life and has guided across the state for many years. Listen in to find out when the best times to fish and how to fish the best places in Colorado. He shares these tips and secrets in his books Colorado's Best Fly Fishing, Sight Fishing for Trout, and How to Catch the Biggest Trout of Your Life, in addition to two DVDs: Landing the Trout of Your Life and Weapons of Bass Production, both of which also feature John Barr. Landon's passion for fly fishing has allowed him to make several noteworthy contributions to the sport. Among them are his appearances as the headliner in the International Sports Exposition Shows (ISE) at each of their shows in four states for five years, 2008 - 2013 (www.sportsexpos.com). Landon travels to fly-fishing related organizations in regions of the Mid-Atlantic, west, Pacific Northwest, southwest, and southern states, teaching through guided trips, fly-fishing classes, presentations, and demonstrations of his techniques. Landon is a contributing writer for Fly Fisherman and High Country Angler magazines. His contributions also have been featured in publications such as Field and Stream, Fly Rod and Reel, American Angler, Southwest Fly Fishing, and Fish and Fly magazines. 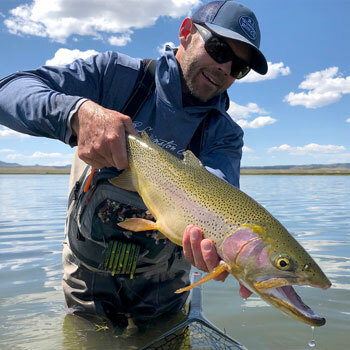 As an ambassador in the fly-fishing industry, Landon represents several lines including Simms Fly Fishing apparel and is a royalty fly designer for Umpqua Feather Merchants. He is also an advisory team member of Simms, Ross, Scientific Angler, Smith Optics, Fish Pond, and Casio Pro Trek watches. For more information on Landon's' guide service, books, articles and DVDs visit his web site at www.Landon Mayer.com.